Our nonprofit, Green Map System, Inc. has re-licensed the once-copyrighted Green Map Icons, v3 for use under the Creative Commons BY-NC-SA license (+CC). This Creative Commons 4.0 license means you can freely use the Green Map Icons on non-commercial projects of any kind, adapt and share them provided that you give credit to Green Map System and share your project as described below. Reciprocity from any income-generating project is expected. Our +CC: for any commercial or non-conforming usage, you must contact us in advance for permission. 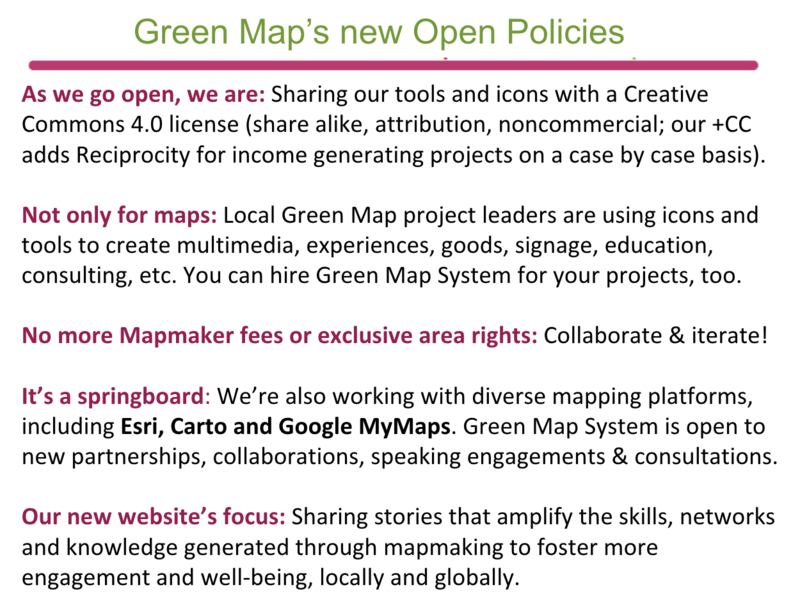 Green Map's icons and selected engagement tools are licensed under the Creative Commons, as detailed here. We encourage you to include, reprint or otherwise use our work under the terms below the list of what you can create. Creative Commons 4.0 United States License, allows additional requirements as a +CC. Green Map System adds: For any commercial or non-conforming usage, you must contact us in advance for permission. The Green Map logo is trademarked in the United States, the European Community and Taiwan. This trademark is not licensed under the Creative Commons, and the trademark is retained by Green Map System. You may request a limited license using the form below. This is a one-year license has automatic renewals unless terminated in writing by Green Map System. Our policy may change without prior notice. Generally, if you are using our icons and tools for positive projects, as per the perimeters above, you may use the name Green Map. In order to cite Green Map System, we suggest that you use this citation format, or similar. The above notice appears on all copies and documentation. The name "Green Map System" shall not be used in any advertisements or publicity programs without specific permission.